The business environment now is changing much faster than ever before. Proliferation of products in a given marketplace is the mark of the day. New age media are making it more challenging for the organizations to ensure that every buck spent creates that extra bang. Further, the product life cycles are reducing drastically. All this only underscores criticality of the methodical planning, and speed of execution to achieve business success. 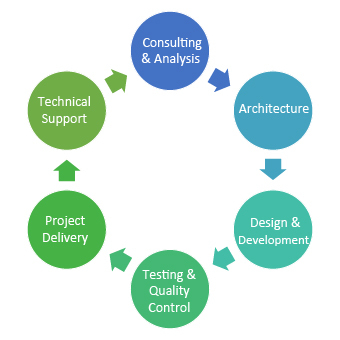 At arroWebs, we adopt the Agile methodology, which allows us to make the relevant iterations at each stage of the project development and delivery. We lay extra emphasis on on-going communication and collaboration between all stakeholders, which allows us and our clients the flexibility to adapt to the emerging business realities. We work closely with our client organization using our special project management tool – AWMaze.in, rightfully pronounced as ‘amazin’. The tool allows to crack open the project into small pieces/tasks, and further manage all related communication in threads, which are available for reference at all times to all team members. It enables accountability and fast response to all the individuals involved in the project. It thus brings the team at arroWebs and at our client organizations on the same platform, boosts seamless communication so as to allow efficient development and delivery of projects.